The Partnership for Action on Computing Equipment (PACE) is a multi-stakeholder partnership established to address the environmentally sound management of used and end-of-life computing equipment. The multi-stakeholder Working Group, comprised of representatives of personal computer manufacturers, recyclers, international organizations, academia, environmental groups and governments developed the proposed scope of work, terms of reference, financial arrangements, and structure of PACE. The Partnership was launched at the ninth meeting of the Conference of the Parties to the Basel Convention, which took place in Bali, Indonesia in June 2008. Computing equipment has improved the lives of people everywhere. As global use expands, society everywhere faces new challenges from the impacts of the entire life-cycle of computing equipment. According to United Nations Environment Programme, some 20 to 50 million metric tonnes of e-waste are generated worldwide every year, comprising more than 5% of all municipal solid waste. In 2006, the eighth meeting of the Conference of the Parties to the Basel Convention on the Control of Transboundary Movements of Hazardous Wastes and their Disposal adopted the Nairobi Declaration on the Environmentally Sound Management of Electrical and Electronic Waste which called for more structured and enhanced efforts towards achieving global solutions for management of e-waste problems and among others encouraged Parties to develop further partnerships targeting e-waste. 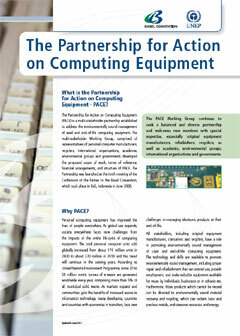 In the following years, the Partnership for Action on Computing Equipment (PACE) was developed as a multi-stakeholder public-private partnership that provides a forum for representatives of personal computer manufacturers, recyclers, international organizations, associations, academia, environmental groups and governments to tackle environmentally sound refurbishment, repair, material recovery, recycling and disposal of used and end-of-life computing equipment. PACE was launched in 2008 by the ninth meeting of the Conference of the Parties to the Basel Convention, with decision IX/9 , which agreed with the mission, scope, working principles and activities of PACE. A Working Group was established as the operating mechanism for the Partnership that operated under the guidance of the Basel Convention Open-ended Working Group. At its twelfth meeting, the Conference of the Parties to the Basel Convention extended the PACE mandate, requesting among others the PACE Working Group to complete the outstanding tasks from the partnership 2014–2015 work programme and to develop a strategy and workplan for the implementation of concrete actions at the regional and national levels. In 2017, the PACE Working Group submitted the final documents developed under the partnership to the thirteenth meeting of the Conference of the Parties to the Basel Convention. By decision BC-13/12, the Parties adopted, on an interim basis, the guidance document on environmentally sound management of used and end-of-life computing equipment. The Parties further decided that the Working Group had successfully completed its mandate and was disbanded. Interested Basel Convention regional and coordinating centres were invited to take the lead in the implementation of activities listed in the work programme set out in the concept note on a follow-up partnership to the PACE and, based on the work undertaken, to propose further development of the concept at the regional or international level, as the need arises. Parties and signatories are invited to use the guidance document on the environmentally sound management of used and end of life computing equipment, and the guidelines, manual and reports produced by the PACE Working Group.